Imprivata is a new badging system that is being deployed to key patient care areas. Below, you will find examples of how to use the new system, as well as some videos that show you how everything works. Click" Enroll this card now" and follow the wizard. If this process fails, you may not be provisioned to use OneSign. If this fails, please ask your manager to request access for you. Tap your card on the card reader. The reader will show a green light and beep to let you know that it has been read successfully. If your badge is read successfully, you will now be logged in and see your name in a bubble in the bottom right of your screen. View the Authenticating with Your Badge video. At the OneSign Log On window, enter your username and password. While at the Unlock screen, click “Cancel” or press “Escape” on the keyboard. The workstation is now unlocked and can be used as normal, but will not auto-fill username and password fields. The Yellow Lock Button, and Badging out will all lock the workstation and allow it to be ready for the next user. When you are badged in, your credentials will now be used for things like the Intranet and Epic. If you walk away from a workstation without badging out or Yellow buttoning, someone else can launch Epic and it will auto-login with your credentials. So, when leaving a workstation, please present your badge or hit the yellow lock button to lock the workstation. ALWAYS MAKE SURE TO BADGE OUT/YELLOW LOCK KEY WHEN LEAVING A WORKSTATION! When badging in for the first time for the day, you will be asked for your password. This will happen every 13 hours. Type in your password, and click ok. To access Epic, simply click the Epic Wave icon on the desktop. 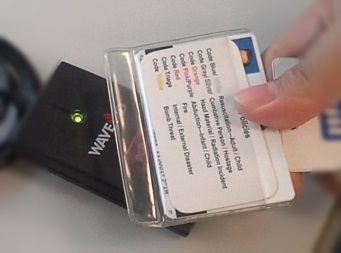 When you are finished on your computer, you will want to "badge out" by presenting your badge to lock the workstation If going to a different area to continue work, present your badge and you will be logged in. When badging in and out of Exam Rooms, an Epic Secure will be performed. This will secure the Epic session and the patient context for the next user. All other applications will be closed. When badging in and out of non-Exam Room shared workstations, you will be logged off of Epic automatically when the next person logs on and all other applications will be closed. Q- I tried to enroll my badge, but it won't let me. You may not have been enrolled in Imprivata. Please call the service desk, and they will get you provisioned for access. Q- I badged in but the reader did not beep, but I was still able to badge in. The badge reader needs to be replaced. Please call the service desk, and we will get it replaced for you. Q- I just reset my password, and Imprivata isn't working right. After you reset your password, you will need to manually log in to Imprivata without using your badge to resync your password with Imprivata. If there are additional issues, please contact the service desk.